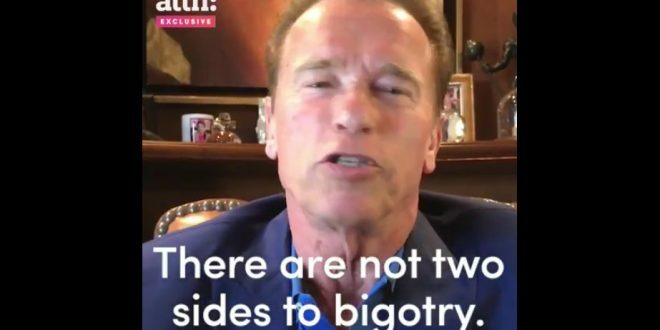 Schwarzenegger Blasts Trump On Nazis [VIDEO] - Joe.My.God. In the wake of the horrific events in Charlottesville last Saturday that left one anti-hate protestor dead and at least 19 injured, Arnold Schwarzenegger called out Donald Trump as well as “Neo-Nazis, the White Nationalists and the neo-Confederates” in a new video for ATTN:, an issues-driven media company. “There are not two sides to bigotry, there are not two sides to hatred,” the former California governor stated, words that seemed directed at Trump’s vacillating response of blaming both the anti-hate protestors and the neo-Nazis for what unfolded. Since Trump did not send an unequivocal anti-racist message, Schwarzenegger offered to write what he thought should have been communicated. “As president of the United States and as a Republican, I reject the support of white supremacists,” Schwarzenegger said in the speech he would’ve liked to have heard.